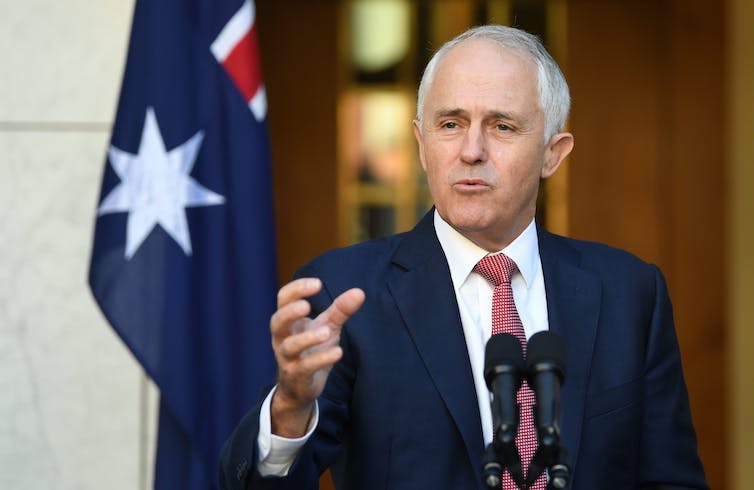 Prime Minister Malcolm Turnbull has proposed tougher language requirements for new citizenship applicants. Citizenship applicants will need to demonstrate a higher level of English proficiency if the government’s proposed changes to the Australian citizenship test go ahead. Applicants will be required to reach the equivalent of Band 6 proficiency of the International English Language Testing System (IELTS). Success in IELTS requires proficiency in both the English language, and also understanding how to take – and pass – a test. The proposed changes will then make it harder for people with fragmented educational backgrounds to become citizens, such as many refugees. How do the tests currently work? The current citizenship test consists of 20 multiple-choice questions in English concerning Australia’s political system, history, and citizen responsibilities. While the test does not require demonstration of English proficiency per se, it acts as an indirect assessment of language. For example, the question: “Which official symbol of Australia identifies Commonwealth property?” demonstrates the level of linguistic complexity required. The IELTS test is commonly taken for immigration purposes as a requirement for certain visa categories; however, the designer of IELTS argues that IELTS was never designed for this purpose. Researchers have argued that the growing strength of English as the language of politics and economics has resulted in its widespread use for immigration purposes. English is undoubtedly important for participation in society, but deciding citizenship based on a high-stakes language test could further marginalise community members, such as people with refugee backgrounds who have the greatest need for citizenship, yet lack the formal educational background to navigate such tests. The Refugee Council of Australia argues that adults with refugee backgrounds will be hardest hit by the proposed language test. Data shows that refugees are both more likely to apply for citizenship, and twice as likely as other migrant groups to have to retake the test. The Adult Migrant English Program (AMEP), where many adult refugees access English learning upon arrival, expects only a “functional” level of language proficiency. For many adult refugees – who have minimal first language literacy, fragmented educational experiences, and limited opportunities to gain feedback on their written English – “competency” may be prohibitive to gaining citizenship. This is also more likely to impact refugee women, who are less likely to have had formal schooling and more likely to assume caring duties. prevent refugees from completing the citizenship test. Similar patterns are evident with IELTS. Nearly half of Arabic speakers who took the IELTS in 2015 scored lower than Band 6. Will those dealing with trauma-related experiences gain exemption from a high-stakes, time-pressured examination? What support mechanisms will be provided to assist applicants to study for the test? Will financially-disadvantaged members of the community be expected to pay for classes/ materials in order to prepare for the citizenship test? The IELTS test costs A$330, with no subsidies available. Will the IELTS-based citizenship/ language test attract similar fees? There are also questions about the fairness of requiring applicants to demonstrate a specific type and level of English under examination conditions that is not required of all citizens. Those born in Australia are not required to pass an academic test of language in order to retain their citizenship. 1) Community consultation is essential. Input from community/ migrant groups, educators, and language assessment specialists will ensure the test functions as a valid evaluation of progression towards English language proficiency. The government is currently calling for submissions related to the new citizenship test. 2) Design the test to value different forms and varieties of English that demonstrate progression in learning rather than adherence to prescriptive standards. 3) Provide educational opportunities that build on existing linguistic strengths that help people to prepare for the test. Equating a particular type of language proficiency with a commitment to Australian citizenship is a complex and ideologically-loaded notion. The government must engage in careful consideration before potentially further disadvantaging those most in need of citizenship.